The places that we live in have a fundamental impact on our wellbeing. Sadly there is a strong social and economic gradient in the quality of our local environment. We don’t all have the good fortune to live in well-designed, quality environments. The most successful public spaces are those that people play a role in designing and shaping and that offer continued opportunities for involvement. How can we ensure that more communities have access to well-designed public spaces that they have shaped? 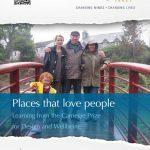 This summary report makes the case for well designed, community led public spaces contribute to community and individual wellbeing and drawing on the experiences of our winners and sets out 5 actions that policymakers and practitioners can take to support the development of ‘places that love people’.